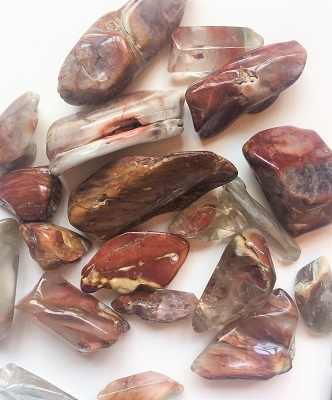 Beautiful Angel Amphibole Phantom Quartz Crystal tumbled stones with creamy white, tan, fiery orange-red, and soft grey colored inner wisps of swirling minerals from Brazil. 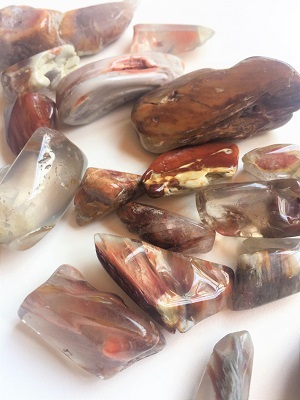 Amphibole Angel Quartz’s energetic vibrations help to facilitate deep inner joy and is gentle and calming. 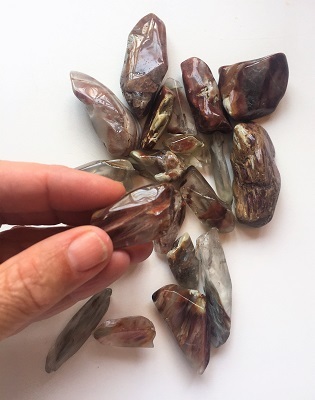 Amphibole Angel Quartz provides a connection to the highest level of spiritual experience, calling in your guardian angels and higher beings. The Phantoms and inclusions within an Angel Phantom crystal additionally contain the properties of Quartz, Limonite, Kaolinite and Hematite. White Kaolinite opens the inner ear and assists in clairaudient pursuits. Yellow-peach Limonite stimulates intuition and guards against psychic attacks and assists one towards stability and comfort, making this stone a useful companion for spiritual journeying. Red Hematite, a deeply stable stone that provides protection, and dissolves negativity and provides grounding bringing tranquility and emotional clarity. Phantoms symbolize the numerous lifetimes of the soul and take you traveling through multi-dimensions. 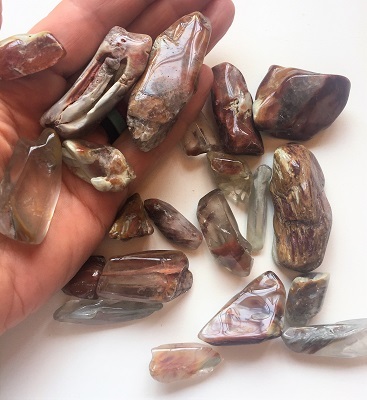 Phantom Quartz breaks up old patterns and assists in reconnecting to ancient wisdom held in your soul memory. It is suggested that Angel Phantom Quartz is the perfect crystal for the work place as it subtly shifts the energies to the highest possible good and brings about cooperation and harmony.